Samsun SDS CEO Won-Pyo Hong is welcoming people to the event. 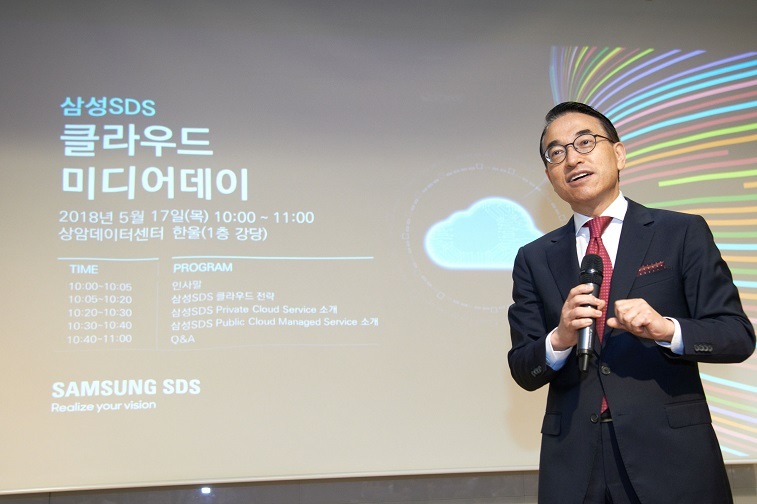 At the Sangam Data Center, the Samsung SDS (CEO Won-Pyo Hong, www.samsungsds.com) showcased their ‘Samsung SDS Enterprise Cloud’, revealing that they plan to start pursuing non-Samsung cloud businesses. 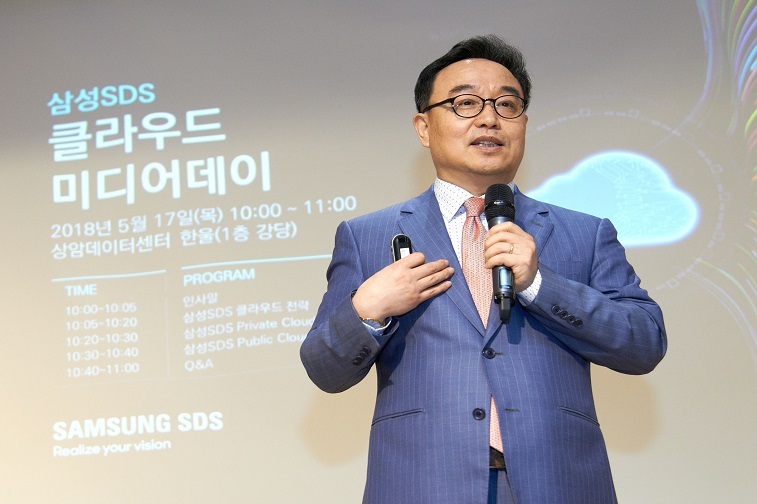 The ‘Samsung SDS Enterprise Cloud’ is a cloud service that is built upon the combination of the accumulated experiences they have gained through converting and operating Samsung affiliated cloud services, and the technologies they have newly acquired through co-working with other world-class enterprises. Recently, global enterprises have faced new challenges such as choosing the most efficient cloud service, converting into suitable cloud services to fit their tasks, converting their cloud service from one model to another, as well as operating multi-clouds. By applying the accumulated task-specific cloud conversion methodologies gained from servicing other Samsung affiliated department, Samsung SDS can service clients with concerns stated above with the multi-cloud total service, which includes everything from consulting, conversion, to operations. In multi-cloud environment that requires both private and public cloud services at the same time, private cloud requires security, reliability, and performance while the public cloud requires a rapid development and cost optimizations. Particularly, the Samsung SDS’s private cloud service has the world’s highest availability (99.999%), guaranteeing a total system downtime of less than 5 minutes per year. It also provides enterprise core services such as ERP (Enterprise Resource Management), MES (Manufacturing Execution System), and SCM (Supply Chain Management). Additionally, through Samsung SDS’s application development specific cloud platform PaaS (Platform as a Services), clients can reduce their time required to build a development environment from a few days to mere 15 minutes, enabling a faster development and deployment of applications. Samsung SDS’s customizable public cloud managed services (CMS) provide △optimal cloud selection, △stable cloud conversion, △maximizing cost efficiency, and △ management of heterogeneous cloud through GOV (Global One View). Samsung SDS also plans to launch supercomputing cloud in the second half of this year, providing cloud-based computing resources for high-performance computing and large data processing such as artificial intelligence and big data analysis. Information about Samsung SDS news and ICT can be found in Samsung SDS Newsroom. Migrate your IT systems to a secure private cloud-based environment for enterprise such as SAP S/4HANA or CRM. Our experts deliver cloud migration consulting, system deployment, conversion and operation services using their extensive deployment and operation experience. Spot Instance is an AWS product that enables the use of unused EC2 resources at an inexpensive price and therefore can bring cost savings of up to 50-80% compared to On Demand costs. But the EC2 service may shut down and be discontinued within a few minutes in case the market price exceeds the set maximum price. Because of this there are a lot of concerns that customers have about buying a Spot Instance. SDS Spot-Inst service assists you in using Spot Instance in a stable way through convenient creation of Spot Instance and non-disruptive switching. Discover our cloud migration and operation service that delivers the stability of a private cloud with the flexibility of a public cloud. As an IaaS service, SDS Cloud Mission Critical combines highly stable cloud infrastructure architecture with operation expertise. Take advantage of all the services needed for public cloud from deployment to operation. We offer a wide variety of services to ensure you maximize the benefits of public cloud from cost reduction, multi-cloud management and integrated management.